Sports Twill — also known as Tackle Twill and Poly-Twill — is our registered name for the fabric lettering used to decorate athletic apparel. Originally used for football, it is a very tough, durable material now used on all sports jerseys and cheerleading uniforms. 51” Polyback Sports Twill features an anti-fray thermal adhesive backing (P600 1.5-Mil 49″ Polyback) that completely seals the twill yarns and provides stability for cutting + sewing onto garments. A tried-and-true solution that is designed for activewear. Recommended for use with the following fabrics: Acrylics, 100% Cotton, Polyester Knits (not Mesh), 100% Polyester, Poly-Cotton Blends, Poly Form, Cotton Caps, Polyester Mesh and Nylon. What Is Polyback Sports Twill? Tackle Twill is a generic name for the fabric lettering used to decorate athletic jerseys. Originally used for football, it is a very tough, durable material now used on all sports and cheerleading uniforms. Our registered version of it is called Sports Twill. We coat the Polyback Sports Twill with a proprietary adhesive (P600 1.5-Mil 49″ Polyback) so that it can be cut easier, layered, re/positioned and heat pressed. Polyback Sports Twill has a hardness specification on the upper end, which makes it much easier to achieve a clean cut. Clean cuts are are critical for embroidery machines that demand a precise edge to put a zigzag or satin stitch on the design. NOTE: Polyback Sports Twill must be sewn down onto the garment(s). Why Buy Our Polyback Sports Twill?  As the manufacturer, we offer Polyback Tackle Twill in more colors than anyone else. 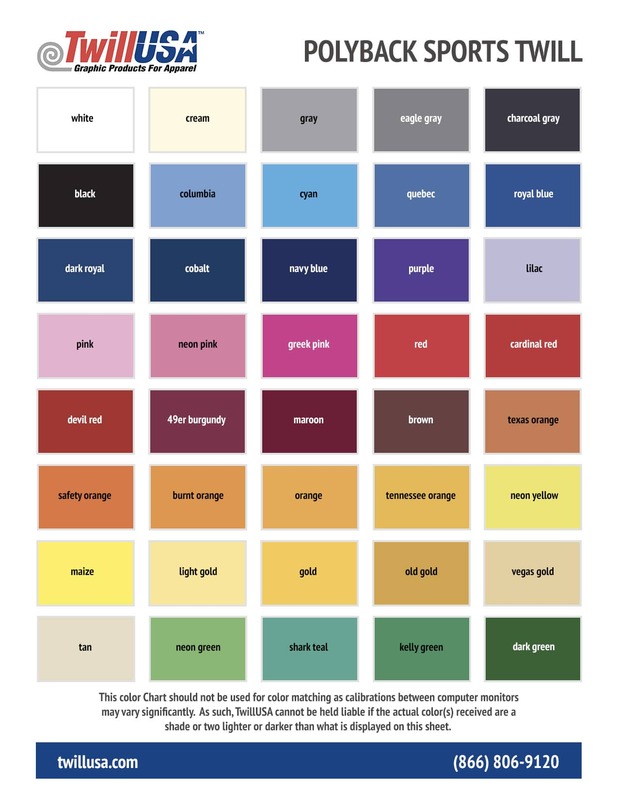 Available in 40 colors — White, Tan, Cream, Black, Gray, Eagle Gray, Charcoal Gray, Cyan, Quebec, Cobalt, Columbia, Navy Blue, Royal Blue, Dark Royal, Lilac, Purple, Pink, Neon Pink, Greek Pink, Red, Devil Red, Cardinal Red, Maroon, 49er Burgundy, Brown, Shark Teal, Neon Green, Kelly Green, Dark Green, Orange, Burnt Orange, Texas Orange, Safety Orange, Tennessee Orange, Gold, Old Gold, Light Gold, Vegas Gold, Maize and Neon Yellow. Compare that to Dalco Athletic’s 17 colors and Stahls’ 16 colors. Why buy from JOANN, Hobby Lobby, Michaels® or other middlemen online when you can purchase direct from the manufacturer? Twill USA has dozens of Heat Transfer Materials in hundreds of colors, warehouses in Nevada and Indiana for fast delivery, plus $10.00 flat-rate shipping on all orders. Contact our USA-based Customer Service Team at (866) 806-9120 or email sales@twillusa.com with any questions or concerns. Is The Polyback Sports Twill PVC-Free? 51″ PSA Sports Twill and our proprietary Hot-Melt Adhesives are 100% free of Polyvinyl Chloride (“PVC”). PVC contains dangerous chemical additives that can be harmful to your child’s health. Yes. After cutting, the Polyback Sports Twill can be heat-pressed onto the garment to hold the design in place while sewing. If you are looking to heat press the garment after sewing, we recommend our PSA Permanent Sports Twill or Permanent Sports Twill instead of the Polyback. Can I Cut Polyback Sports Twill On A Tabletop Plotter? Tabletop plotters aren’t 51″ wide, so the material will need to be cut down first. 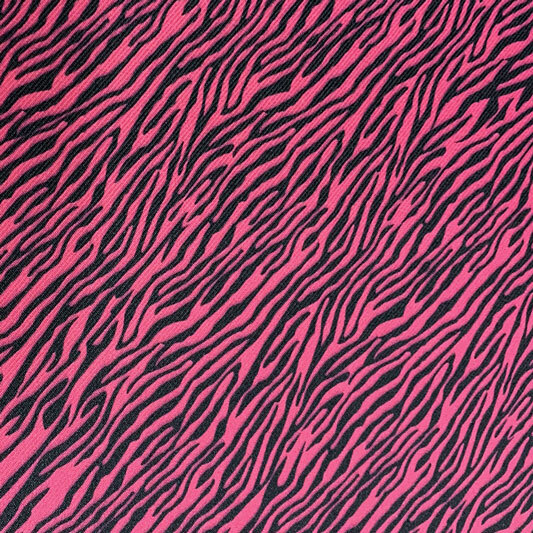 However, once properly sized, this fabric cuts clean on all desktop cutters including Cricut and Silhouette Cameo. All forms of cutting work on the Polyback Sports Twill — laser, plotter, flat-bed plotter, die cutting and shearing. What Blade Should I Use To Cut Polyback Sports Twill? 60° blades work best for cutting 51″ Polyback Sports Twill. On some machines it’s called the “thick” blade. Does Polyback Sports Twill Feature An Adhesive Backing? The thermal adhesive backing completely seals the twill yarns and provides stability for cutting + sewing onto garments. Its polyester-based coating has no PVC and can be cut on plotters, dies, lasers or even hand-cut. This adhesive system — (P600 1.5-Mil 49″ Polyback) — is available separately for coating materials other than Tackle Twill. How Long Does Polyback Sports Twill Last On The Garment? We have tested this material up to 50 wash and dry cycles in a home laundry environment without fraying, cracking or peeling. 51″ Polyback Sports Twill is sewn down onto garments, so it should last as long as the garment itself. Can I Use Polyback Sports Twill To Embroider Custom Patches? Yes. The 51″ Polyback Sports Twill works perfectly for embroidering patches. 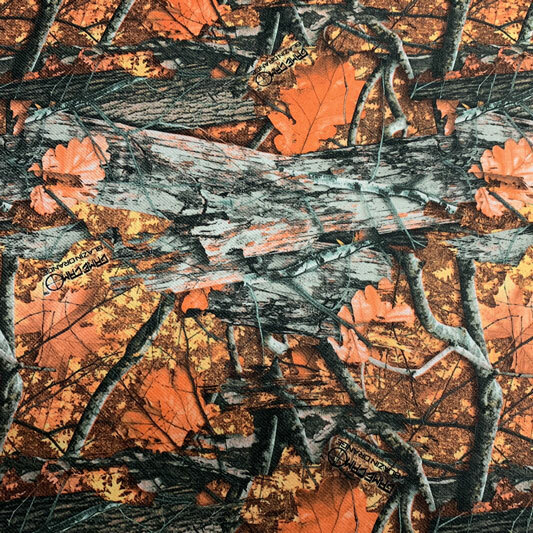 Can I Sublimate Onto Polyback Sports Twill? Which Tackle Twill Product Is Best For Sublimation?